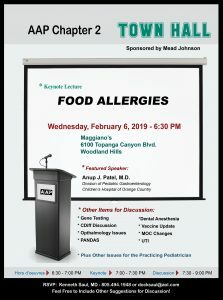 Join AAP-CA2 Member-At-Large Ken Saul, MD, FAAP for a Town Hall at Maggiano’s, in Woodland Hills on February 6, 2019. Please save the date! Location: Maggiano Woodland hills 630 on Food Allergy.